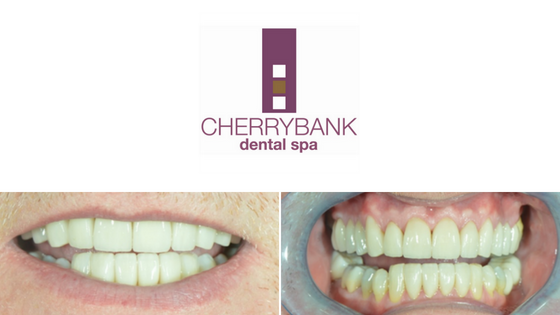 Mr B came to Cherrybank Dental Spa with periodontitis, a form of gum disease, and some bone loss, as well as severe wear and tear and spaces in between his teeth. He was concerned that he would have to have his teeth removed and replaced with implants. As a business owner, he was keen to improve the overall look and health of his teeth and gums. 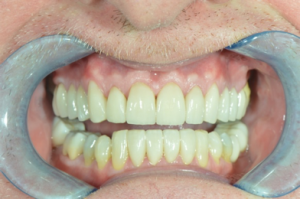 Dr Jodie Fulton recommended periodontal therapy to improve the stability and health of gingiva (his gums) before commencing with Zoom Whitening. 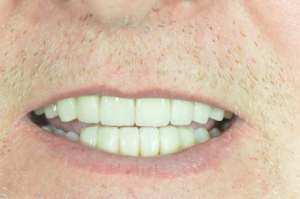 Mr B had upper and lower porcelain veneers as well as upper and lower amalgam replacements and a bridge to replace a missing tooth on the lower left side. Mr B was also prescribed a night guard to protect his restorations as he experiences bruxism – commonly known as teeth grinding. Mr B was delighted with the outcome of the treatment and pleased with how smooth the entire process was. 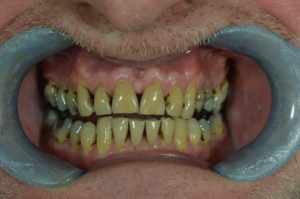 He was especially happy that he could keep his own teeth instead of needing dental implants, and that this was a much less extensive, less invasive and less expensive solution. Overall, he is very happy that he went ahead with the treatment. At Cherrybank, we are always delighted to hear positive feedback from our patients, especially when the treatment has been a transformational experience. It is our goal is to care for your dental health, as well as improve your entire sense of well-being. To book a dental treatment consultation at Cherrybank Dental Spa, or to find out more about how we can help you, call us today at our Edinburgh office, 0131 341 3699, or our Perth office, 01738 481 742.